Create an interactive map for the current and previous years. Maps available for Total Offences, Theft from Residences and Vehicle-Related Offences, Domestic Violence and Commercial activity Offences. The Annual CrimeMalta report was launched in April 2017. The report is attached for publication perusal. 2016 figures depict a generic trend line decrease in reported crime though experiencing a near-stabilisation of the recent increase in offences. 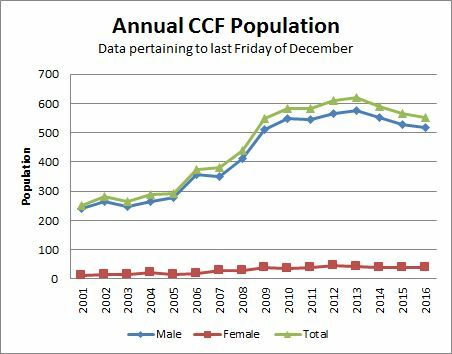 The past years’ fluctuation increase was caused by one specific offence subcategory. The Maltese offence profile has maintained last year’s shift from a public-oriented to a personal-target dimension. Crime is evolving from a social-space structure to the invasion of personal-space. As part of a review of RISC Modelling for the Maltese Islands, a number of analytical studies have been carried out for the period between 1998 and 2016. Domestic Violence and Commercial Activity-related RISC has been included as from 2015. In terms of Grand Total Offences, San Giljan maintains its perennial hold at the top of the League, hosting over 5 times the national rate of offences, which is calculated as the observed offences as against those which should potentially occur in those areas under study. At a rate between 2 and 5 times the national rate, Mdina followed a close second, which group also comprises Valletta, Floriana, Sliema, San Pawl il-Bahar and Marsa, a rank similar to the 2015 report, except that Ta’ Xbiex was overtaken by Marsa. At a rate between the national up to twice that rate one can find Msida, Ta’ Xbiex, Gzira, Marsaxlokk, Gudja, Zebbug (Gozo), Paola, Mellieha, Ghajnsielem, Birzebbugia, Pieta, Birgu and Bormla. Whilst this category of offences registered no councils having over 5 times the national rate of offences, in 2016, the relative RISC still appears for those towns experiencing the phenomenon. Marsa, San Pawl il-Bahar, Msida, Swieqi, Xghajra, San Lawrenz, Ghasri, Zebbug (Gozo) and Pembroke registered within the 2x-5x RISC. In contrast, most other zones have lower than average rates and that Gharghur and Fontana registered zero residential offences in 2016. During 2016, San Giljan took top stop, followed by Marsa, Xghajra and Floriana as the highest RISC areas where one's car could be vandalised, broken into and/or stolen, which towns host between 2 and 5 times. Note that these towns host the largest parking and transport-related activities that attract offenders to high-volume and relatively less monitored opportunities. At the other end of the scale, Kercem, Sannat and Gharb registered zero vehicle-related offences. Domestic violence reports pertain to stalking, slight bodily harm, grievous bodily harm and psychological harm. Ghasri, Xghajra and Bormla host between 2 and 5 the national rate as against the 2015 high-rates Birzebbugia, San Pawl il-Bahar and Floriana. 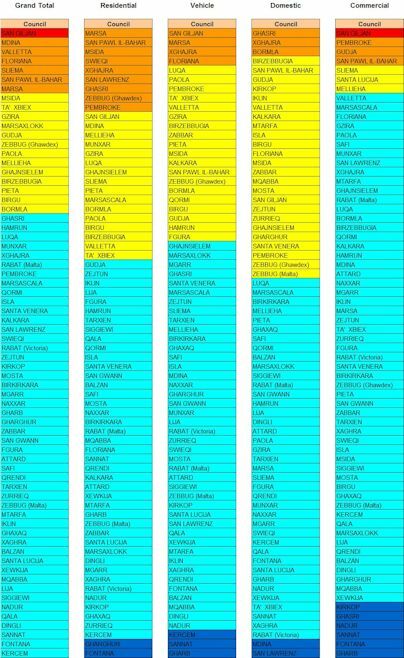 With diminishing rates of RISC, it is imperative to note that a significant number of councils exhibit some form of domestic violence that is above the national rate (yellow in the RISC maps depicted in the CrimeMalta website) at 1-2 times the rate. In effect all towns have incident reporting but may register lower than national rates. At the other end of the scale, Mdina and San Lawrenz registered zero offences, a phenomenon also found in rural and small areas were the changes in legislation may yet have an effect in terms of encouraging victims to report. San Giljan hosted the highest RISC rates, which at the top of the League, host over 5 times the national rate of offences. Pembroke, Gudja and San Pawl il-Bahar was registered at second place hosting between 2 and 5 times the national rate of offences, indicative of their proximity to the main economic centres such as the San Giljan recreational zone and the Gudja airport. The least RISC registering towns at zero RISC include Kirkop, Ghasri, Nadur, Sannat, Fontana and Gharb.. The results shown hereunder review the five specific crime categories through a comparitive approach across the years. Data from 1998 to 2015 can be reviewed through the submenu below. The results are also published as a series of Interactive Crimemaps using high-end technology called Spatial Information Systems which allow users to generate their own maps on dangerousness and safety. The data is published for the three crime categories detailed above and at District or Local Council levels. The Malta Corradino Correctional Facilities high rate of incarceration has seen a slow but steady decline over the past weeks, having gone below the psychological threshold of 600 residents. Figures as at 30th Decmeber 2016 registered progressively lower rates compared to the previous years, though still double the figures registered in 2001. 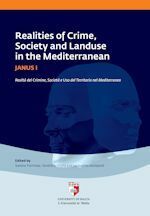 The Department of Criminology within the Faculty for Social Wellbeing has concluded a 3-year study of Crime in Malta and Sicily as an expansion on the research that was carried out and is updated by Prof Saviour Formosa of CrimeMalta. 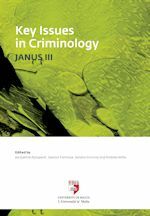 As part of the outputs, 3 publications (2 focusing on the the outcomes from the project and one on theoretical issues in Criminology). Books can be downloaded from the link below. 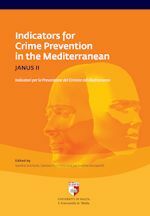 The CrimeMalta Website brings you real crime analysis based on 16 years of research. In a study initiated in 1997, crimes from 1950 to date have been geocoded and digitised to help create analytical tables and charts that are easy to understand and review. 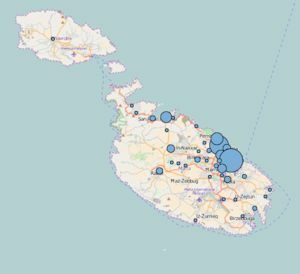 Using state-of-the-art technology (GIS - Geographical or Spatial Information Systems), crime reported to the Malta Police Force since 1998 have been mapped based on the offence location. 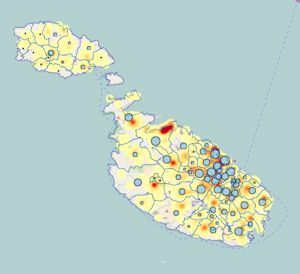 This process enables spatio-temporal analysis of crimes in Malta by the location they occur in, when they are committed and the potential link to the place they occur in. 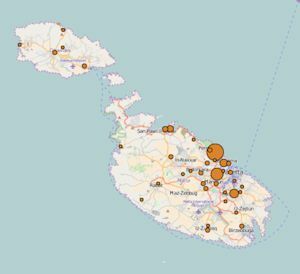 A Web-GIS of Maltese Crime will enable users to browse and print maps of crime at different spatial layers such as districts and local councils as based on the NUTS (administrative units classification) nomenclature. Smaller units have been analysed foremost amongst which are enumeration areas as identified by Census. Another feature developed in this site concerns the CRISOLA and RISC Models, the former giving methodological substance to crime and space, whilst the dynamic RISC Model enables the creation of a league table of local councils as they experience offence reporting over time. Outputs at annual and monthly by crime categories will be reviewed. More detailed RISC information is available on request. 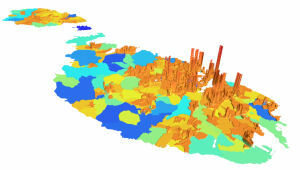 In addition, statistical and spatio-statistical outputs will be generated. The map below shows such a map based on crime locations reported in the Grand Harbour and the results of a method called clustering analysis that shows the major hotspots of crime in the region. Visitors to this site are encouraged to subscribe to our newsletter informing them of new occurrences and information relative to crime trends in the Maltese Islands.